- Sheikh Al-Nimr, during a Friday sermon in 2011. On January 2nd, 2015 Saudi Arabia executed the prominent Shiite cleric Nimr Baqir al-Nimr along with 47 other Saudi prisoners. The executions took place in 12 cities, where firing squads and beheadings were used as the means of execution. Sheikh al-Nimr was a widely revered Shiite Muslim cleric from Saudi Arabia’s Shiite majority Eastern Province. An outspoken critic of the government, al-Nimr was a mobilizing force during anti-government protests that erupted in 2011 as part of the Arab Spring. He was arrested in 2012, convicted, and sentenced to death in 2014 for "disobeying the ruler," "inciting sectarian strife," and "encouraging, leading, and participating in demonstrations." Amnesty International has stated that al-Nimr's lawyer was denied the opportunity to defend him at his trial, and noted that witnessnes whose testimonies were used during the proceedings did not actually testify in court. The Saudi government has long played the role of an equal opportunity oppressor when it comes to dissent in the kingdom. Following the Arab spring protests, the government has enforced an "undeclared state of emergency." Sunni Islamists, Shiite activists, liberal reformers, bloggers, writers, journalists, atheists and human rights advocates have all been arrested and imprisoned with the help of new laws that were implemented in the wake of the 2011 protests. Cultural, social and political freedoms in Saudi Arabia remain among the most repressed in the world. In March 1992, King Fahd ibn Abdul Aziz issued the Basic Law of Government, "codifying the largely unwritten legal system of the country.” Most universally recognized human rights guarantees did not find a place in the new decree. The Basic Law did not guarantee freedom of the press, protect free speech, freedom of assembly or association. It did not, for instance, ban extrajudicial killings, torture, or cruel and inhumane punishment. Saudi law continues to permit and validate these barbaric methods as instruments of state policy. Despite the serious rights violations in the Basic Law, the United States government publicly endorsed these laws in 1992 without voicing any reservations. The U.S. State Department “disregarded the authoritarian nature of the laws and their failure to recognize most basic civil and political rights.” The U.S. praised the new laws as important steps “towards participatory government and recognition of citizens' rights." During the early stages of the Arab spring, the Saudi monarchy anointed itself as the guardian of counterrevolution in an effort to contain and reverse revolutionary gains. It gave Egypt $4 billion to stamp out dissent following the ouster of Mubarak, while simultaneously meddling in Yemen’s politics, a pattern of manipulation that escalated into military intervention in 2015. Domestically, it clamped down on dissent and issued a decree banning the “reporting of any news that undermines national security, promotes foreign interests, or slanders religious leaders.” It soon passed legislation that defined terrorism as any act that "disturbs public order, shakes the security of society, or subjects its national unity to danger, or obstructs the primary system of rule or harms the reputation of the state." New criminal procedure laws came into effect that legalized indefinite detention of prisoners without charge or trial. These new laws have created a legal framework that criminalizes all dissidence, and classifies non-violent protest, thought or expression as an act of terrorism. Most pundits and journalists have called the execution of Sheikh al-Nimr Riyadh’s "sectarian move” and highlighted Saudi Arabia’s Wahhabi religious nationalism as the factor that explains its behavior. They have predicted an increasing Shia-Sunni divide and protracted violence. But this is not just a case of Shia-Sunni violence, or of Iran and the Saudi monarchy’s regional play for hegemony. When the Saudi monarchy decided to arrest and execute al-Nimr they were well aware of the ruptures and shifts this would produce within the Kingdom and beyond. The execution was a calculated choice made by a ruling elite that has over the years exercised a range of options, from depriving the political rights of its subjects to violent suppression as means of holding on to power, not unlike the means employed by Assad’s Syria or Sisi’s Egypt. Sheikh al-Nimr was a vocal critic of the government of Bahrain, where the Sunni-led monarchy suppressed Shiite protests. The Saudi monarchy sent troops to help Bahrain crush the uprising out of concern that it would spread and destabilize other Arab Gulf countries. The sheikh also spoke out against the Iran-backed government in Syria for suppressing protesters there. He criticized the House of Saud, Saudi Arabia's ruling family, for its regional and domestic policies and spoke out against individual royal family members. In March 2009, during Friday prayers, al-Nimr said that “unless the systemic discrimination and oppression of Saudi Shiites at the hands of the political and religious establishments ends," they would consider seceding from the Kingdom. In a subsequent internet posting he is reported to have said: “Our dignity is being held, and if it’s not set free, we will examine other options, and any legitimate option will be examined.” On another occasion, he urged protesters to resist police bullets using only “the roar of the word.” In another 2011 Friday sermon he stated: "You are surrounded by fear, intimidation, persecution and abuse." His public sermons over the years began to use to language of resistance, freedom and dignity. His personal history also endeared him to the public as a figure of courage and resistance. His grandfather, Sheikh Muhammad bin Nasir al-Nimr, was the leader of a popular revolt against the House of Saud in 1929-1930, an event that figures heavily in the literature of the Islamic Revolution Organization in the region, the now banned parent organization of most political Shiism in Saudi Arabia today. It was the potential power of al-Nimr, the figure of thoughtful resistance, and the possibility of political transformation through such resistance that the Saudi monarchy feared the most. A thinking man is still the greatest threat to a violent state. Following al-Nimr's execution Iran’s Supreme Leader Ayatollah Ali Khamenei released an image comparing Saudi Arabia to Islamic State on his official website. 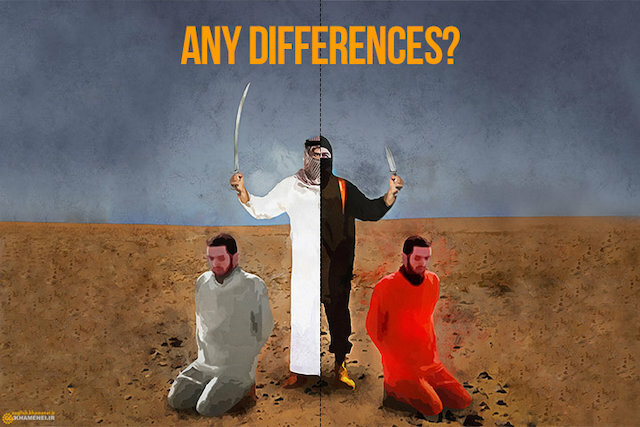 The picture depicted two executioners standing side-by-side, one Saudi and the other belonging to Islamic State with English captions reading “Any differences?” Khamenei is not the first to draw comparisons between the militants of Islamic State and Saudi Arabia. Both follow a repressive Wahhabi ideology, and Saudi Arabia’s continued use of public executions (predominantly by beheading) is similar to the barbaric technique employed by Islamic State. If the implication is one of brutality and the grotesque use of violence to reach one's end, then it is not just the Islamic State or the Saudi monarchy that stands implicated. On the same spectrum of brutality, China and Iran lead in number of executions per year. The other countries making up the world’s top five executioners in 2014 were Iran, Saudi Arabia, Iraq, and the USA. In countries like Iraq, Iran, China, Pakistan and Saudi Arabia, governments continue to use the death penalty as a tool to suppress political dissent and deal with threats against state security. China, Pakistan, Iran and Iraq have all executed people accused of “terrorism." In China, authorities made use of the death penalty as a punitive tool in the “Strike Hard” campaign against unrest in the Xinjiang Uighur Autonomous Region. In 2014, three prisoners were condemned to death in a mass sentencing rally conducted in a stadium in front of thousands of spectators, transforming penal punishment into public theatre meant to send a strong message to dissidents. These state actions from Saudi Arabia to China represent the relationship between the State and the nature of dissent—the nonlinear relationship between government (elected democratically or otherwise) and violence, and what happens when dissent becomes the state's primary preoccupation. These examples paint a sinister picture of the machinery of the state carrying out premeditated, extra-judicial, state-sanctioned killings on a mass scale often designed to suppress dissent. While Saudi public beheadings are barbaric, how do we draw logical, ethical or moral distinctions when the state becomes the ultimate arbiter over life and death when confronted with dissent? State terror—whether employed by tyrants, totalitarian regimes, theocracies, or democracies against their subjects—is the most brutal form of terror. The most powerful and successful terrorists today are states, whether it is United States, Saudi Arabia, North Korea, Iran, India, Syria, Iraq, or Pakistan (this is, by no means, an exhaustive list). Terrorism originally meant government by terror. The 1798 Dictionnaire of the Académie française defines terrorism as “systeme, regime de la terreur.” While the meaning of terrorism has metamorphosed to mean acts committed by non-state actors against a state, the fundamental nature of the state to employ terror as an instrument of governance, and most often the instrument of repression and suppression of dissent has remained. While the concerns of religious nationalism and the threat posed by Islamic State or other non-state actors are real, they do not exist in a moral, ethical, or geopolitically disconnected vacuum. We have to acknowledge that there is a rapidly spreading dystopia within the borders of all modern states. The real battles to be fought are not in distant media-created realities of West Asia but within the bounded territories of the states we call home. The battle is to retain our citizenships as a political right, and not as a fragmented right to merely exist. Broader practices of dissent are imperative to citizenship whether within a democracy or in other systems of governance. In these battles, ideas such as “ lesser evil,” “greater good,” and “security over liberty” are all arguments that are intellectually shallow and morally reprehensible. It also shows the utter lack of political imagination when confronted with the reality of threat, repression and violence. Structures embedded in the cold logics of realism that privilege realpolitik over rights and cunning over civil liberties are not just problematic but deeply flawed in practice. There can be no ethical flexibility in our critique of power. If we are to move forward, the criticism of one brutal act of state-sponsored murder must result in the deconstruction and interrogation of all acts of state-sponsored murder.